Fall Celebrations: Martinmas - Joyful Toddlers! First off, start leaving the lights off a little more, so that you and your children can really notice that it’s getting darker. 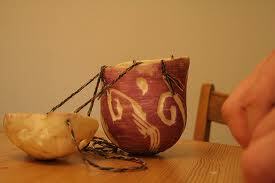 Where you can, use small lamps or light candles to add more light. 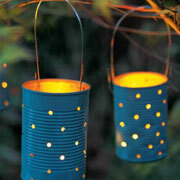 Then, start making your lanterns. 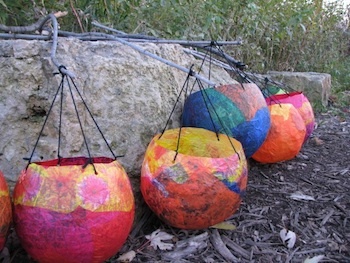 One of the biggest-bang-for-your-buck lanterns is the paper mache lantern made with balloons, and there is a lovely description (with photos) of how to make that type of lantern here: http://www.waldorffamilynetwork.com/saints.html . 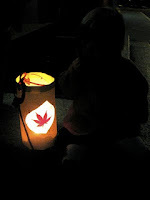 Toddlers can help make this type of lantern quite easily. Or, if you have big boys who love to use tools, make a tin-can lantern. Take a used can and fill it with water, then put it in the freezer. Once it is frozen, you can put it in a plastic tub with a towel in the bottom, and make holes with a hammer and nail. If you get a nail started, a child can “help” hammer it in. Wonderful ideas! 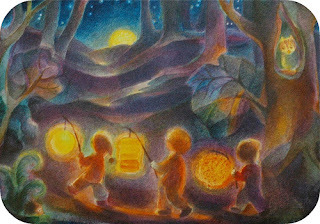 My co-teacher and I were just talking today about trying to plan a lantern walk for our nursery school next week and this post is the perfect inspiration, thanks! I just came across this post — how wonderful! We are off to my son’s martinmas celebrations at his nursery this evening (it will be his second martinmas celebration. i’m hoping to continue the festival once he leaves nursery and we homeschool next year. Thanks for this beautiful, informative, and nostalgic essay. I shared your link on my blog! P.S. Can you tell me what artist created the sweet lantern painting at the top? Hi Kitti, Thanks for writing! I actually don’t know who painted that picture. It sure is a sweet one, though. Does anyone else know?